Net Promoter Score is an important metric in measuring customer loyalty and satisfaction. Every score above 0 is considered "good" (50 points and above being "excellent"). 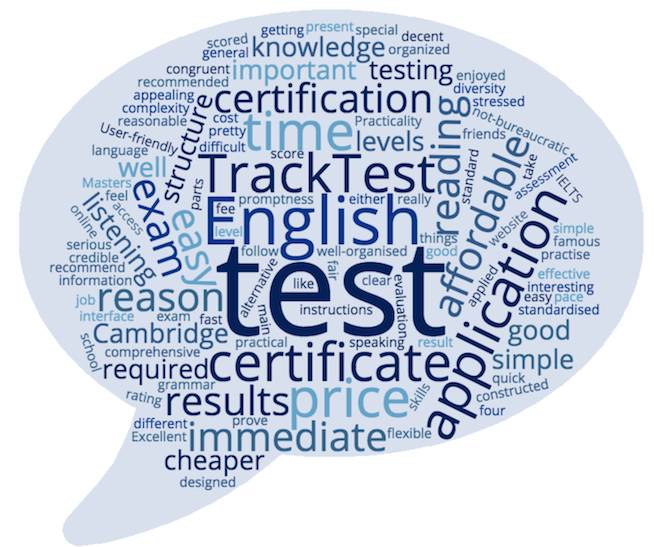 TrackTest English Test scored NPS 54 (Excellent) in 2017. Most of them were positive, 67% would actively recommend our tests to friends or colleagues. You were also asked about the reasons for giving us that score. Based on your feedback, you particularly liked the structure of the test, its reliability, practicality and price. "A good way to practise language including reading and listening." "My main reason for taking the TrackTest is that it is one of the requirements for my application for the Master programme in Belgium." "I would recommend it for a job application (that do not require other types of English tests such as IELTS)." "Well designed and organised, clear, simple but serious. Reasonable price. It was difficult to find standardised online test issuing a decent prove of results." "Web page is easy to find and use. The test is pretty much comprehensive." "I can try English at all levels. The tests contain all important parts. And the price for that is good." "Complexity (grammar, reading, listening), evaluation of results, information about the level." "I liked so much the diversity of the exams based on the four skills (listening, writing, speaking and reading)." "The structure of the exams and the different levels are well organized." "Tests are interesting and well constructed." "A credible certificate in accordance with actual knowledge." "My score got to congruent with my knowledge." "It is a fair assessment and results are immediate." "Easy to follow instructions, immediate certification." "I like the fact that I can do it at home where I am not stressed, I can choose my pace, time of the day (when I feel most awake and there are not disturbing things happening around me)"
"It's practical and not that expensive." "The whole thing was very simple - pay for access, here's the test, here's your certificate. Nothing to waste time with." "The application of the TrackTest wasn't bureaucratic." "The most important reason for my rating is the promptness in which my speaking test was reviewed and scored." "It's cheaper and more flexible than a Cambridge examination"
"The price was affordable, testing doesn't take up too much time, so I already recommended your services to few of my friends." "Your test is standard and the fee is relatively low. The result is immediate also." 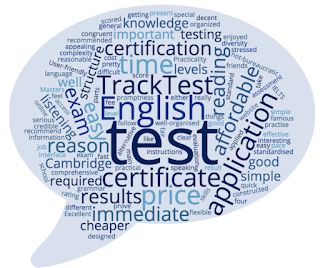 "Because of a fast and unexpected cheaper alternative than Cambridge English certification (i. e. for those already have the certification)"
"Excellent application. You save either time or money (a lot of money in comparison with the most famous exams...)"
"TrackTest provided an easy and cost-effective way of getting a certificate." "I really enjoyed the testing. Also, the price is very appealing (affordable), a special thank you for that." We also carefully read all your suggestions about the things we could improve. We addressed some of them during the course of the year 2017. Other improvements are scheduled for this year. Some of you would like to see the correct answers when you complete the test. Unfortunately, we cannot show them as it would have an impact on the reliability of the assessment. However, we have improved feedback we provide after each English test. You also want us to increase the recognition of our English certificate. In next few months, we will announce the new features and partnerships which will further enforce this message. Thank you all for being with us in 2017!